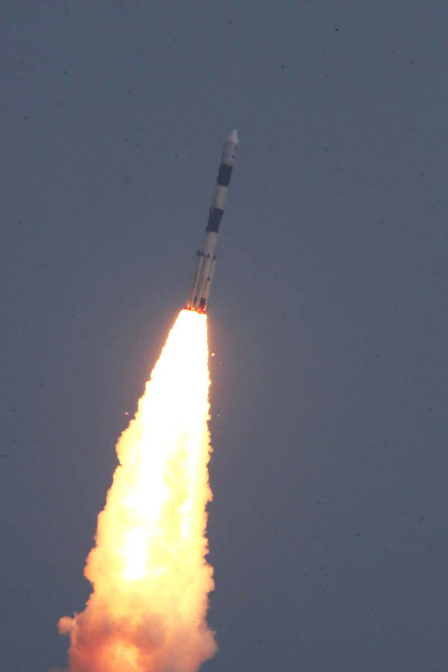 In its thirty first flight (PSLV-C30) conducted today (September 28, 2015), India's Polar Satellite Launch Vehicle successfully launched ASTROSAT, the country's Multi Wavelength Space Observatory along with six foreign customer satellites into a Â Â 644.6 X 651.5 km orbit inclined at an angle of 6 deg to the equator.Â The achieved orbit is very close to the intended one.Â Â This was the thirtieth consecutive success for PSLV. PSLV was launched today in its heaviest âXLâ version with six strap-on motors of the first stage. The launch took place from the First Launch Pad at the Satish Dhawan Space Centre SHAR (SDSC SHAR), Sriharikota, the spaceport of India. Soon after its separation from PSLV-C30, the two solar arrays of ASTROSAT were automatically deployed and the Spacecraft Control Centre at the Mission Operations Complex of ISRO Telemetry, Tracking and Command Network (ISTRAC) at Bangalore took control of ASTROSAT. ASTROSAT was realised by ISRO with the participation of all major astronomy institutions including Inter University Centre for Astronomy and Astrophysics (IUCAA) of Pune, Tata Institute of Fundamental Research (TIFR) at Mumbai, Indian Institute of Astrophysics (IIAP) and Raman Research Institute (RRI) of Bangalore as well as some of the Universities in India and two institutions from Canada and the UK. In the coming days, ASTROSAT will be brought to the final operational configuration and all its five scientific payloads will be thoroughly tested before the commencement of regular operations.